Corn and wheat markets continue to climb the ladder today while soybeans have corrected a bit following a good evening of overnight price action. March corn is trading at a six month front month high of 365, November soybeans traded almost to 1010 last night but have pulled back slightly on supply news from Brazil along with some sabre rattling out of china regarding bean imports. July wheat is above 5.00 for the second time this year and moving. Cotton markets have turned from the belle of the ball back in early Jan to a complete dog as we go into opex on Friday. The bean story today is the USDA attache to Brazil increasing the soy crop there from 110 MMT to just over 112 MMT. This was expected, but it takes a little steam out of the Argentinian story going on right now. 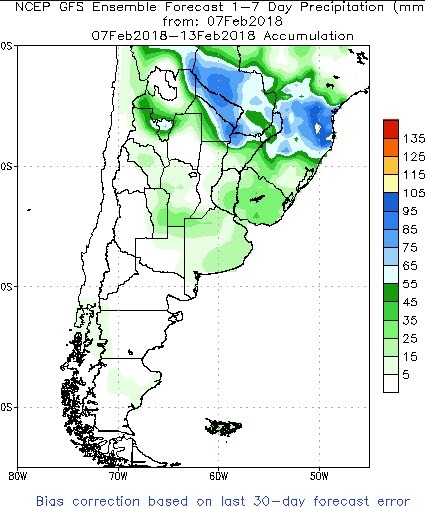 The thought is Argentina is going to see estimates for soy fall from 56 MMT to 50 MMT, Brazil increasing 2 MMT (probably more as we go, big crops get bigger) so there is some offsetting effect that will occur. WASDE is tomorrow, S.AM numbers will be the most scrutinized as will the cotton demand numbers. Other than that I am not sure we have much to look forward to outside of a possible surprise in Wheat from a poor Australian crop. 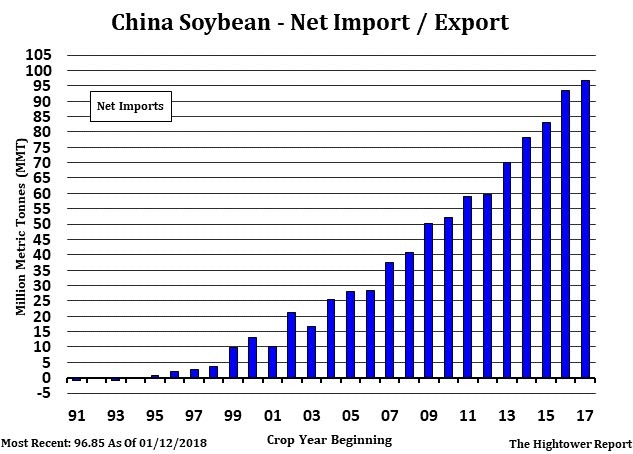 There is a separate story floating around right now about bean import tariffs for US beans to China…..Ill believe it when I see it. If anything China tariffs US beans and then buys meal instead. Money talks and bs walks, China needs soy like I need air to breathe. July wheat KC wheat has broken out above 5.00 today. This is a function of US weather and a weaker dollar and low acres. US wheat exports in December were better than a year ago while January looks to have lagged a little bit. This, combined with the weather story has the bears to the run. I am not a huge fan of put options in markets like corn or soybeans right now, they are too expensive relative to their return in my opinion. But in the market we see in wheat right now, they should be explored as we climb the ladder toward last year’s highs (570 front month). Be ready to buy a 570 Dec put for 20 cents. A floor at 550 is probably the best a hedger can do right now without getting their head cutoff if wrong. Selling a certain supply is impossible at this point, I work with clients who made 600 sales last year. I don’t know if they could tell you if they would be able to meet any of those commitments at this point. It is really all about whether it rains. If forecasts change and we see rain, supply will be there and prices will most likely fall back closer to the front month range near 420-440 (currently 470). It is still really early to get too worried, but the market is starting to price in some premium. If you want to sell rallies, BUY CALLS NOW. If you want to wait for the rally, then a put strategy later is what I would look for. Cheap corn remains the theme even as board prices rally this morning to medium term highs. Dec corn is hunting the 4.00 price point as it trades 394. 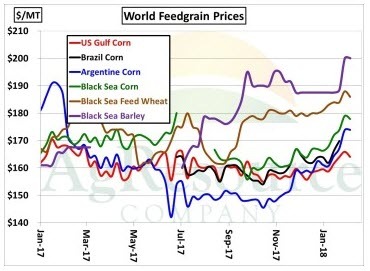 US feed grain remains the cheapest in the world by a substantial measure. It is the cheapest feed by almost 30 cents per bushel into April. We have seen good buys this week from Japan and “unknown”, I expect corn to remain strong over the short term. I have not even mentioned South America. Yesterday, Informa who is normally pretty conservative with mid crop year adjustments, dropped Arg from 42 MMT to 39 MMT and pegged Brazil corn (which is late to be planted right now) at 88 MMT. There is a real possibility we see SAM produce a sub 120 MMT corn crop vs the 137 MMT we saw a year ago. 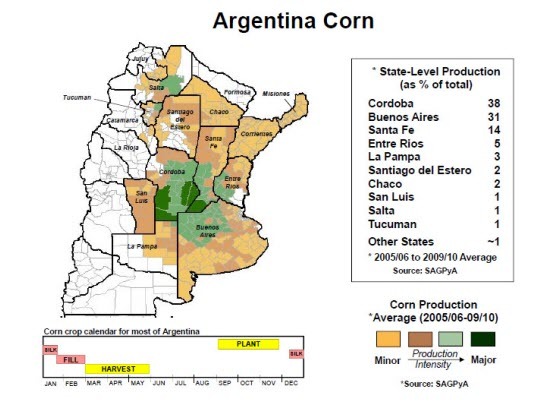 Argentina has been very active in the corn export market, I imagine we get that business. Now, we are ONLY talking about 200-300 million bushels but it is enough to get the shorts moving out in my opinion. Whether or not we see May corn prices rally going forward is one thing, but I believe we have seen the last of the 350 price point on the front month. I do not see enough of an acreage jump to get the supply story to change until we start talking about US yields. Over in cotton, March futures are getting routed by the deferred contracts as we head into op-ex and delivery. Three weeks ago March held a 7 cent premium to December. This morning, it sits at 1.5 cents. Long liquidation of speculators is the reason. If I were a betting man, Id take a shot on buying some May cotton calls as March heads into delivery. We are now trading at the lowest levels since late December. Cotton gins continue to catch up as exchange deliverable stocks have almost doubled from 40 K to 70 K in the last month. Tomorrow is a big day for cotton bulls. Exports will be out in the morning which have been fantastic outside of the hiccup two weeks ago and then WASDE. There is a hope we see exports raised by 150-200 k bales but the USDA has been disappointing in the past regarding exports. Ending stocks will probably be near 5.5-5.6 million bales, well above the 2.7 from the end of last year and the low 4’s a year ago at this time. World production may be the wild card as India will be in the cross hairs. I think the USDA probably disappoints, the market brings a bunch of cheap march puts into the money and then we rally next week. That was the action we saw in December. Exports tomorrow may be more important than WASDE for that to happen. It’s hot in central Argentina. High temps ranged from the mid 90’s to the lower 100’s. It is an understatement to say the rains expected this weekend are paramount. 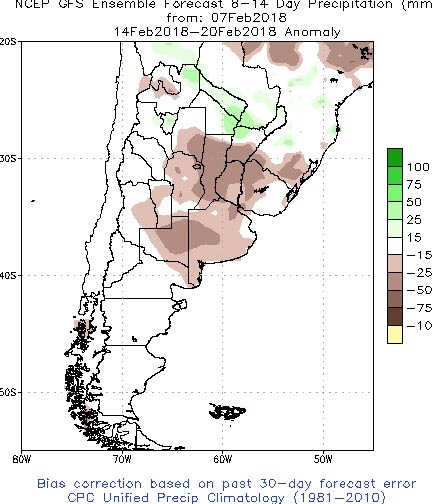 The forecast calls for another 1-2 days of Argentine heat/dryness before showers arrive during late Friday and linger into the weekend. The best chance of rain is with a frontal pass from Saturday into Monday with totals estimated in a range of .2-1.25”. 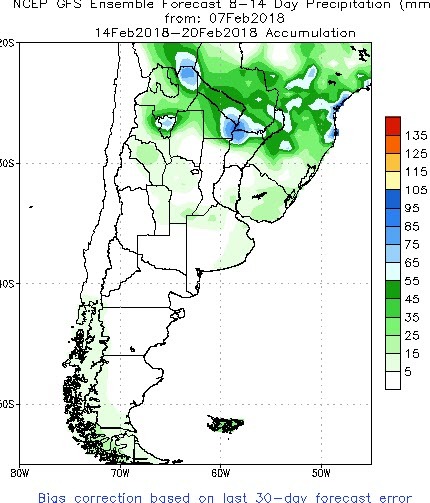 The southern half of the Argentine ag belt looks to receive just .2-.6” of rain while the north sees totals near 1.00”. The forecast is dry next week, but temps cool to seasonal averages. Beyond that there is not much on the two week. Brazil remains wet, which will delay corn planting further as bean harvest is slow. Brazil has planted 2% of the crop vs 22% a year ago. 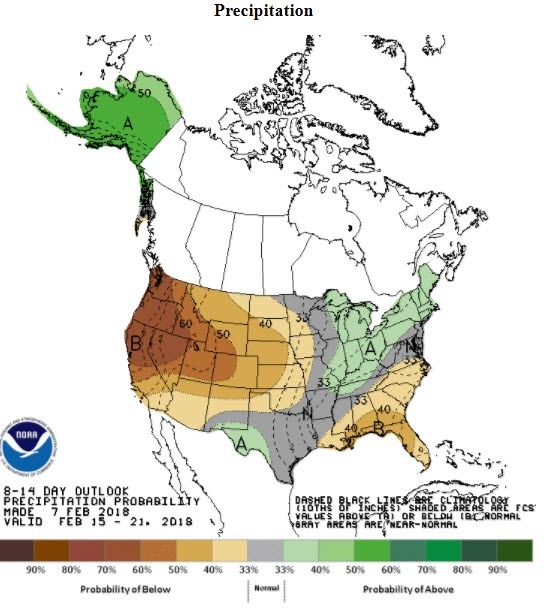 Precip chances are limited for the US Central Plains for another 2 weeks, but there are hints of better rains is the last week of February. Wheat traders need to stay locked in on this.